Keeping your resume up to date ensures that those employers looking for qualifications that match yours will easily find you. 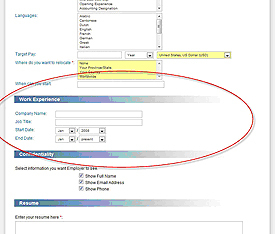 Now you can outline your last/current work experience in your Hcareers resume. With this new feature, you will be able to effortlessly stand out against other job seekers while allowing for employers and recruiters to find your resume more easily. We strongly recommend that you take a few minutes to log into your Hcareers account to update your recent work experience in your resume. Once logged in, select 'post resume'from the top menu and click on the corresponding 'modify' link. Add in your previous work experience if preferred, as well as updating any other information that has become outdated. Once you are happy with your changes, scroll down and click 'submit' to complete the process.